Facet joint pain, otherwise known as facet joint syndrome or zygapophysial joint pain, is back pain generated by the facet joints. The facet joints are made up of two protrusions located at the back of the each vertebral body and are present between each adjacent vertebra. They are the only lubricating joints present in the spine. They are highly involved in load transmission when standing and stabilize the body when bending forward or extending to an upright position. This puts a lot of stress on the joints. Pain from the facet joints is typically due to degeneration, inflammation, and injury. The lumbar facet joints (that is, facet joints present in the lower back) can cause pain that radiates down to the buttocks and thighs, while cervical facet joints (that is, facet joints of the upper extremity such as the neck) can cause pain in the neck, head, and other upper extremities. In Europe, almost 50% have experienced back pain, and when considering only lower back pain, 10-15% of the cases originate from the facet joints. Back pain, however, is usually multi-factorial and the rate of back pain due to facet joints as an isolated cause is reportedly low (only 4%). Localized pain – pain referral patterns have also been studied where it’s been deduced which joints would cause pain in what area(s) of the body. It should be noted that only 15% of cases of low back pain have the exact source of pain identified, even with clinical history, physical examinations, radiological examinations, and electrophysiological tests. Many spinal structures can generate pain – excluding facet joints, there are also discs, vertebral bodies, nerve roots, muscles, ligaments and fascia as possible pain generators – and the situation is further complicated by the fact that back pain is usually multifactorial. Facet joint pain may not be definitively diagnosed using clinical examination and radiological diagnostic techniques. While these cannot consistently identify facet joints as sources of pain, clinical history and examinations should be done to eliminate other possible pathologies. The use of diagnostic blocks is reportedly the only diagnostic means to accurately identify the facet joints as the source of pain. Medial branch blocks (MBBs) diagnosis involves using local anaesthetics to inject near the nerves that supply the facet joints, while intra-articular injections are applied directly into the joint space. After injection, the patient is observed for pain relief that is consistent with the expected duration of pain relief of the anaesthetic used. Both methods are equally effective in diagnosis. Using two diagnostic blocks with different durations of pain relief at different occasions can be done to reduce the rate of false positive observations, which reportedly occurs in 17-41% of patients. There is currently no established conservative method specifically for treatment of facet joint pain. Most experts agree that treatment of non-specific benign back pain can be employed. This includes education, exercises and the use of analgesics such as nonsteroidal anti-inflammatory drugs (NSAIDs) and acetaminophen. 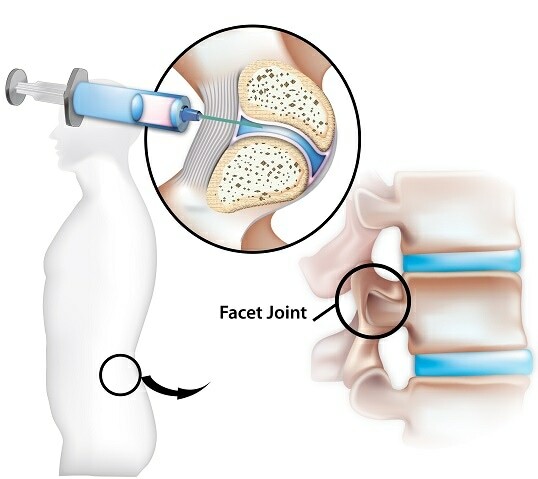 For facet joint pain, specific treatment options include the use of medial branch blocks, intra-articular injections, and neurolysis, where the nerve fibres are degenerated by the use of physical or chemical agents in order to interrupt transmission of nerve signals. The latter can be achieved by using chemical neurolysis, cryoneurolysis or radio frequency, the latter of which has been found to be effective in 60% of patients up to one year. The efficacy of these treatment options on facet joint pain remains controversial, with contradicting literature and insufficient evidence (1-4). Manchikanti L, Singh V. Review of chronic low back pain of facet joint origin. Pain Physician. 2002;5(1):83-101. PubMed PMID: 16896360. Binder DS, Nampiaparampil DE. The provocative lumbar facet joint. Curr Rev Musculoskelet Med. 2009;2(1):15-24. doi: 10.1007/s12178-008-9039-y. PubMed PMID: 19468914; PubMed Central PMCID: PMCPMC2684949. Saravanakumar K, Harvey A. Lumbar Zygapophyseal (Facet) Joint Pain. Rev Pain. 2008;2(1):8-13. doi: 10.1177/204946370800200103. PubMed PMID: 26525677; PubMed Central PMCID: PMCPMC4589934. Cohen SP, Huang JH, Brummett C. Facet joint pain–advances in patient selection and treatment. Nat Rev Rheumatol. 2013;9(2):101-16. doi: 10.1038/nrrheum.2012.198. PubMed PMID: 23165358.